Caracas Chronicles: Selling guns to FARC? Moi? 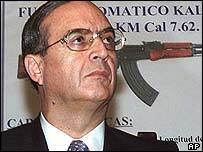 A blast from the past: Vladimiro Montesinos, the one-time power-behind-the-Fujimori-throne in Perú, has been convicted to 20 years in jail for secretly selling 10,000 guns to Colombia's main communist guerrilla, FARC. The point? Put him in hands of independent investigators, and JVR's secret buddy - and, one can't help but suspect, role model - it turns out he was arming FARC. (Plus, remember, Montesinos was nominally right-wing.) So, when we fret that Venezuela's Kalashnikov purchases are going to end up in narcoguerrilla hands, are we paranoid, or merely realistic?